DETROIT — A controversial monument to be unveiled Saturday downtown is an event that Michigan Christians have tried to shut down, according to a news release. The Satanic Temple will reveal the 1-ton, bronze, goat-headed idol called Baphomet after 9 p.m. ET to those who have bought $25 to $75 tickets. The location of the unveiling is secret — the original venue canceled the booking — and will be sent to ticket-holders via email Saturday, officials said in the release. The fête, which the group calls the largest Satanic ceremony in history, will kick off its legal efforts to secure placement of the monument next to a Ten Commandments monument on public grounds in Arkansas or Oklahoma. The statue is backed by an inverted pentagram and flanked by statues of two young children gazing up at the creature, which has horns, hooves, wings and a beard. It cost more than $100,000 and had been planned for a spot at the state Capitol in Oklahoma City until Oklahoma’s Supreme Court banned religious displays, including a monument of the Ten Commandments, on Capitol grounds. “It was always our intention to take this wherever it was relevant, wherever it was necessary, and wherever that dialogue needed to take place,” said Lucien Greaves, a spokesman for the group, which is less about Satan worship and more about highlighting what it perceives to be improper religious influence on governments. A Ten Commandments monument is planned outside Arkansas’ Statehouse in Little Rock. The statue was to be unveiled at Bert’s Marketplace in Detroit’s Eastern Market district, but Bert Dearing said he returned a $3,000 rental fee when he learned about the group that booked the place. “It would be great if we had a large turnout” for the 10 a.m. Saturday Mass at St. Joseph Catholic Church in response to the statue, the Detroit Mass Mob posted on its Facebook page Friday. Other churches in the Mother of Divine Mercy parish, three historic churches near downtown, also plan Masses specifically because of the unveiling. 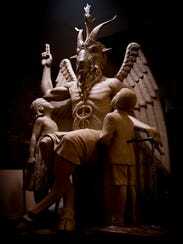 Baphomet, subject of the statue that the temple plans to unveil, was the idol that the Knights Templar were accused of secretly worshiping in chapter houses across Europe and the Holy Land before the order was disbanded in 1312. Back in the Templars’ day, Baphomet was said to be a disembodied head but has been represented as a goat-headed figure since the 1800s. The Satanic Temple, different from the Church of Satan founded in the 1960s, views Satan not as an evil figure, but one who dared question authority. The temple also advocates for the separation of church and state. Baphomet is meant to symbolize plurality and religious liberty, Greaves has said. Jex Blackmore, Satanic Temple Detroit chapter founder, has said the group doesn’t worship Satan but does promote individuality, compassion and views that differ from Christian and conservative beliefs. Its chapter has more than 200 registered members. New York City-based sculptor Mark Porter, who worked on the statue for five months in a Florida near Daytona Beach, Fla., said he initially found the task creepy. My question is, when there was racial turbulence in Virginia a few weeks ago, various church figures voiced their opinions publicly a stated that there would be no tolerance for hatred in their prospective cities. Their speeches can be found of Facebook, Twitter, Youtube and newspapers nationwide. WHERE WERE THE CHURCHES when this statue was erected? Why wasn’t a nationwide church effort made to stand against this kingdom of darkness? Where were the demonstrations and speeches from the affluent Christian “big wigs” in this country? Where is the power and boldness in the so-called body of Christ? Church, you have failed again!